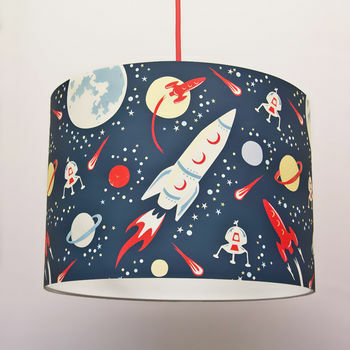 This handmade paper lampshade features our popular Space Rockets design. Featuring moons, planets, rockets and comets it's been designed with a retro feel typical of old space posters so will last well beyond the nursery. The shade is made to a professional standard by hand from high quality art paper attached to a PVC, fire-resistant backing. It can be made as a ceiling pendant or as a shade for a lamp. Art paper on a PVC backing.